A biological oceanographer involved in climate change research, Professor Karin Lochte, Director of Germany's Alfred Wegener Institute (AWI), is extremely well placed to discuss the increasingly central question of ocean acidification, as well as the controversial issue of carbon sequestering. Earlier in her career, she was professor of Biological Oceanography at the Leibniz Institute for Marine Sciences at Christian-Albrechts University in Kiel, where she lead a research unit focused on biogeochemical cycles in the sea. What is causing the current rise in the level of ocean acidification? The rise of CO2 in the atmosphere means that you get more CO2 dissolved in seawater. This additional CO2 reacts with carbonate molecules dissolved in seawater and this reaction causes the water to become more acidic. It results in the same thing as if you have CO2 in a mineral water bottle. It has a slightly sour taste. Why is ocean acidification particularly pronounced in the Arctic and Southern Oceans? This is because you can dissolve gases more easily in cold waters. The result is that you have a higher increase of CO2 in these regions, and thus a higher acidification. What damage has already been done in the Arctic and Southern Oceans? I think the real evidence of damage to the polar oceans ecosystems is not yet there. But if you look at organisms such as pteropods (called "sea butterflies", but they are rather swimming snails), or other small organisms which carry shells made of calcite or aragonite, and project into the future, they will certainly have problems forming their shells when the water is more acidic. This means that we have to consider that these types of organisms may no longer be able to produce their shells, but we don't yet know what it means for the marine environment and food web. Other organisms which are also affected include cold-water corals. Looking forward to 2050 to 2100, these types of organisms will probably change their morphology and biogeographic distribution and it is difficult to predict effects on the ecosystem. Another aspect that also needs to be considered are organisms higher up the food chain that do not have calcium carbonate shells, but which, if you acidify the water, will still take up this acidity through their gills. This may affect their oxygen uptake in the blood, affecting their survival capacity and the extent of their habitat. But of course, we still have to do a lot of research, and at the moment we are only seeing the first glimpses of change. Do you think it is possible to reduce CO2 emissions fast enough to moderate these problems, or is it already built in? The effects of acidification are not really acute at the moment, and the organisms in question are still not severely affected, but of course, this damage limitation is dependent on the political question of how quickly CO2 emissions are reduced. I do hope that the COP15 meeting in Copenhagen in December will be able to bring some advances, but to be honest, I am a bit skeptical. The political situation is such with the US now at the negotiation table, we could make some significant progress, but I am not sure at all that we will. For example, unless the developed countries manage a big and rapid reduction in emissions, I am very skeptical that developing countries will agree to limit their emissions to a low enough level. Earlier this year, AWI partnered with the Indian National Institute of Oceanography on the highly controversial and mediatized LOHAFEX project. Can you tell us what it was all about? 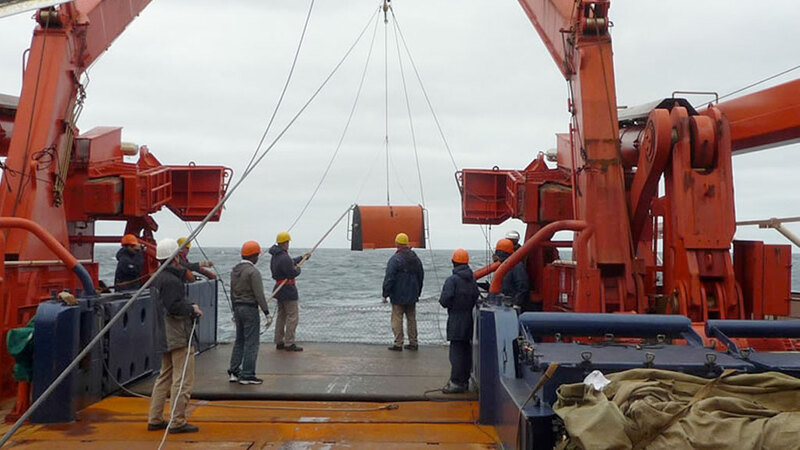 This was the eleventh ocean iron fertilization carried out worldwide, and the third to be carried out in the Southern Ocean. The main trigger for all these experiments is to see how iron input can influence the productivity of the ocean, and influence an ecosystem through the absorption of CO2. Iron is a limiting element for biological production in some parts of the ocean and it reaches the ocean largely through air-borne dust. During ice ages, the hydrological cycles are quite different. There is less evaporation in cold weather, so you have less vegetation cover on earth, and therefore more dust which gets transported from land into the ocean, which in turns means more iron input into the ocean. So the question is, does this iron input trigger more ocean productivity? Does it fertilize the ocean? And can that be part of the CO2 draw down that we see during the glacial periods (compared to inter-glacial). So this experiment was based on this hypothesis and discussions going back twenty years as to whether we could perhaps increase the CO2 uptake of the ocean by fertilizing iron deficient areas. And why did it trigger such a controversy? This is because the geo-engineering aspect of adding iron into the ocean to combat global warming has also been addressed by some commercial companies who want to earn money through the system of carbon credits. As a result, the countries that participated in the international biodiversity convention that took place in Germany last year signed a moratorium that said that there should not be any iron fertilization experiment in view of carbon sequestration, and also that experiments should only be carried out in coastal waters and under strict surveillance. But unfortunately, it is pointless to carry out such experiments in coastal waters, because coastal waters are rich in iron anyway, and we would not be able to see any effect. The rationale behind the decision was a legal one, and had to do with the fact that coastal waters are under the jurisdiction of the coastal state to which they belong and therefore can be regulated. What's more, our experiment had already been in the planning stages since 2004, and this moratorium happened in the summer of 2008 when we were already almost on our way. And on top of it, it was not clear who was responsible for assessing and implementing these new guidelines. So in the end, we provided a risk and impact assessment in accordance with the London Protocol on marine pollution, in order to justify that our experiment would not do any damage to the environment, and would not leave any permanent traces. This was reviewed internationally and accepted. But unfortunately, not everyone agreed with the decision. What about the results of the experiment? These were very interesting, and quite different from those of previous experiments, because our experiment was carried in waters that, although not coastal, did have coastal influence. To cut a long story short, it showed that not all regions in the Southern Ocean could be used for CO2 sequestration by iron fertilization. In fact, the outcome of the experiment is that there was no significant carbon sequestration because the environment reacted differently to the type of experiment that was carried out before. Instead of exporting biologically bound carbon to the deep ocean it was recycled by massive grazing and much of it remained in the surface waters or was again released as CO2 to the atmosphere. Do you have any other future plans or project touching on iron fertilization? No. Right now we are very carefully analyzing the results, and considering the enormous problems we would face to have another experiment permitted, I think we will turn to more fruitful areas! What's more, from a scientific point of view, this experiment was very successful and far reaching. It was carried out from the very beginning to the very end of the plankton bloom, so that we were really able to observe the entire fertilization process. A commercial company, Climos, is planning a much larger experiment that could cover 40,000 sq kilometers of ocean. What is your point of view on that? I think that if you carry out an experiment on the scale proposed by Climos, you will really see if there are major changes in oxygen and other trace gases. The small-scale experiments we have done didn't show any of that because they were probably too modest. And if you want to understand how the larger organisms, such as for example whales, react to ocean fertilization, then you need some large experimental areas. So from a scientific point of view, it would be interesting. But the real question is how, in the future, will we be able to assess whether iron fertilization is a path one should go into for geo-engineering. I am worried about what would be the consequences. The important thing is that science should not become a justification for commercial geo-engineering. Geo-engineering in whatever form, should only be a last resort. We should try other ways beforehand.